For only the second time, the British Society for the History of Science is awarding its John Pickstone Prize to the best scholarly work in the history of science. From a stellar short-list of five, the panel singled out this year’s prize-winning book by Anne Hardy, Honorary Professor at the London School of Hygiene and Tropical Medicine. Elegantly written and thoroughly researched, this pioneering study marks a major advance in the understanding, interpretation and relevance of the scientific past. Anne Hardy uncovers the discovery of food poisoning as a public health problem and of Salmonella as its cause. Based on a case-study of Britain’s experience, her book illuminates the immense international challenge of food-borne diseases that affect all human societies. 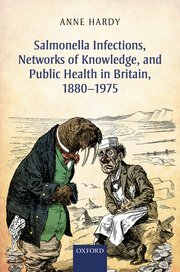 Drawing on a wealth of original archival research and scholarly expertise, Anne Hardy has provided a delightfully lucid and often page-turning narrative of Salmonella over a century. Tying together medical history, social history, environmental history and the emerging field of food history, her book provides a model for future work while filling a lacuna in previous scholarship. Hardy introduces in-depth analyses of developments in an extraordinary range of topics, including the rise of Public Health, microbiology, social statistics, farming practices, food industry practices, consumer demands and political dimensions. Salmonella infections are still causing massive physical and financial hardship – and other bugs will do so in the future. This book is essential for understanding how epidemics arise and how they can be dealt with. Amidst growing concern about the Zika virus, Hardy’s history is a scholarly tour de force that illuminates one of today’s most urgent problems in global public health. For further information, please contact the BSHS Vice-President, Dr Patricia Fara, at Clare College, Cambridge on 01223 333248 or [email protected].